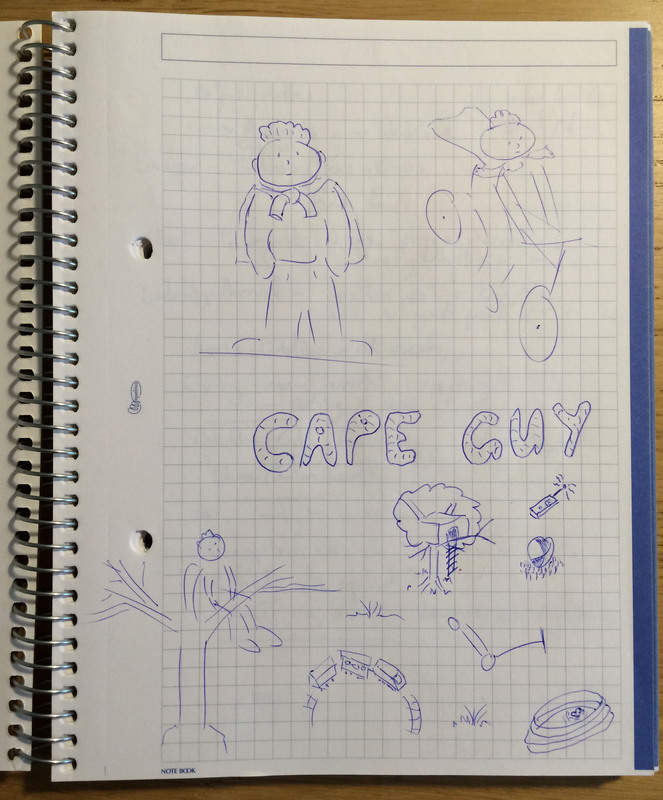 One of the first big challenges of setting up Cape Guy was giving it an identity. Fortunately I’d had the name in my head for a while so that wasn’t an issue. 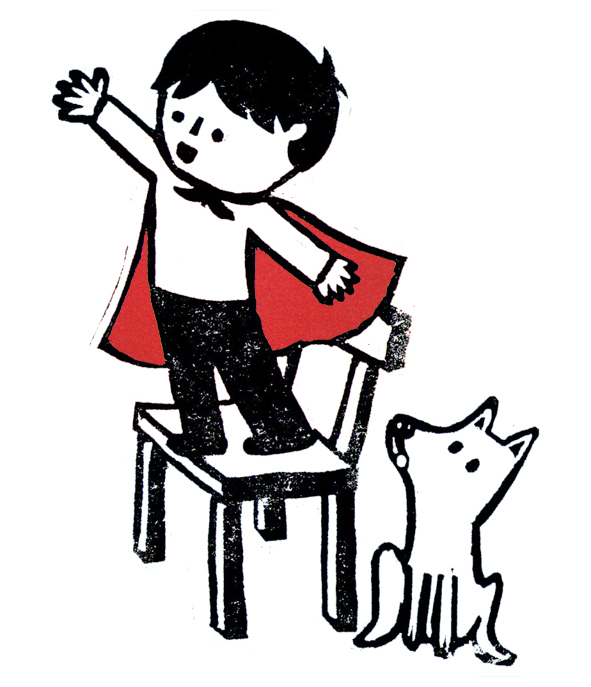 I also knew that I wanted Cape Guy to be a super hero, or at least the pretend super hero identity of a small boy, with a friendly dog called Hero. I wanted to use a comic book style but also a very friendly one. There are many some things that I can do, unfortunately drawing isn’t one of them (yet?). You can see evidence of this below. This meant that to take the Cape Guy brand beyond a vague idea in my head I needed some assistance. That’s why I asked Jemma Kang if she could help. Jemma is an illustrator I know who has worked on several books. She was initially a little hesitant as she assumed I just wanted her to do a regular company logo (something like a name with a blue stripe at JUST the right angle!) but she agreed to meet up and discuss it anyway. I showed Jemma what I’d done and she responded much more positively than I expected to my drawings. She immediately got what I wanted and came up with lots more ideas on top of what I’d already drawn in only a few minutes. We agreed on a rate which I would pay for Jemma’s work and I left her with a signed copy of my masterpiece to go and create sketches from. 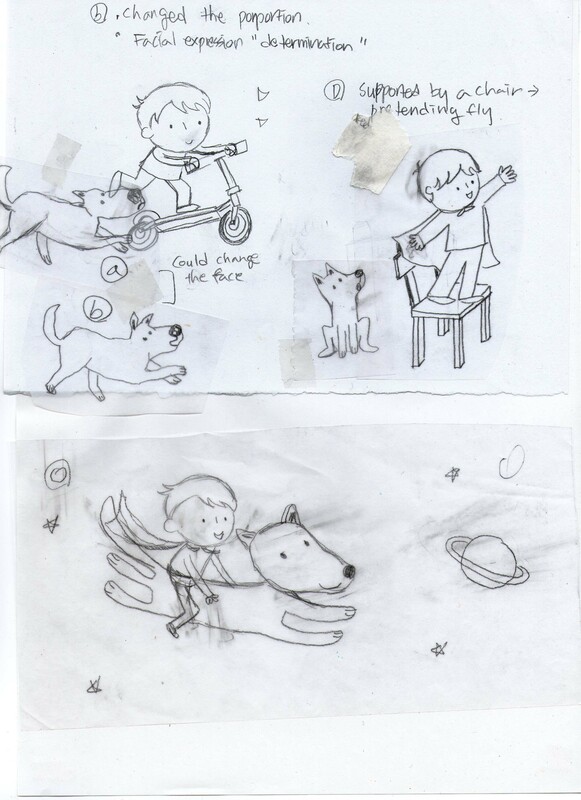 So Jemma went away and did some initial sketches and we did some back and forth emails discussing them. 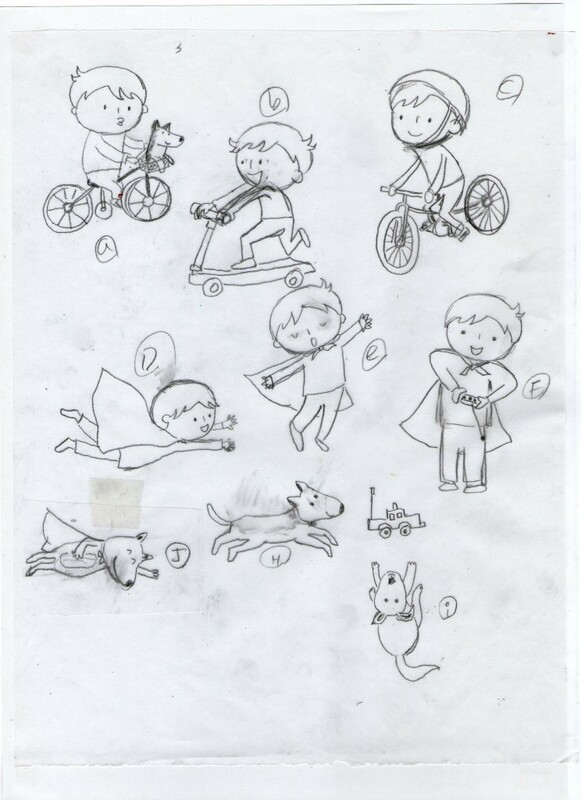 Here are some examples of her sketches. Once we were happy with the sketches we picked a couple to make final versions from. Jemma asked which of various techniques I’d like her to use for this. I briefly considered pretending I knew exactly what she was talking about before remembering the first rule of (eventually) being good at things: never pretend you understand things. Jemma was, of course, very patient with me and explained my options. 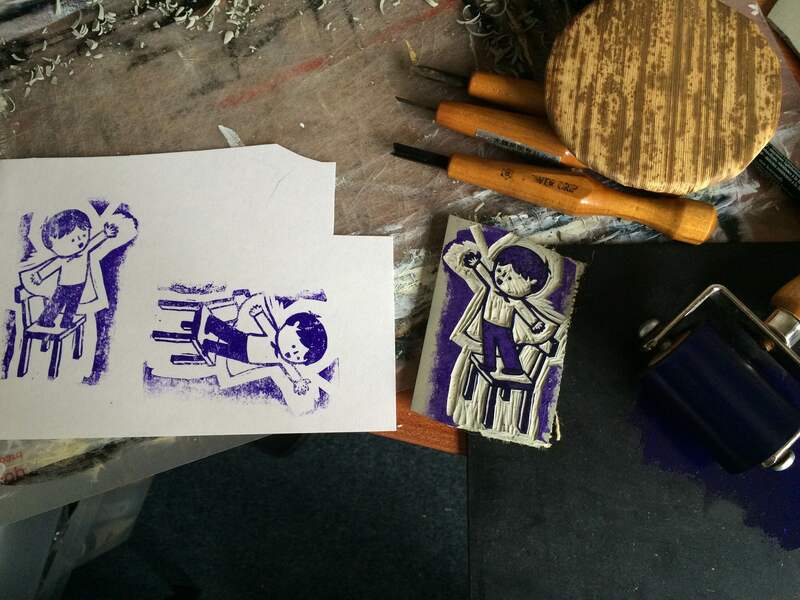 We settled on a printed-lino-carving style which she had used before and got good results from. 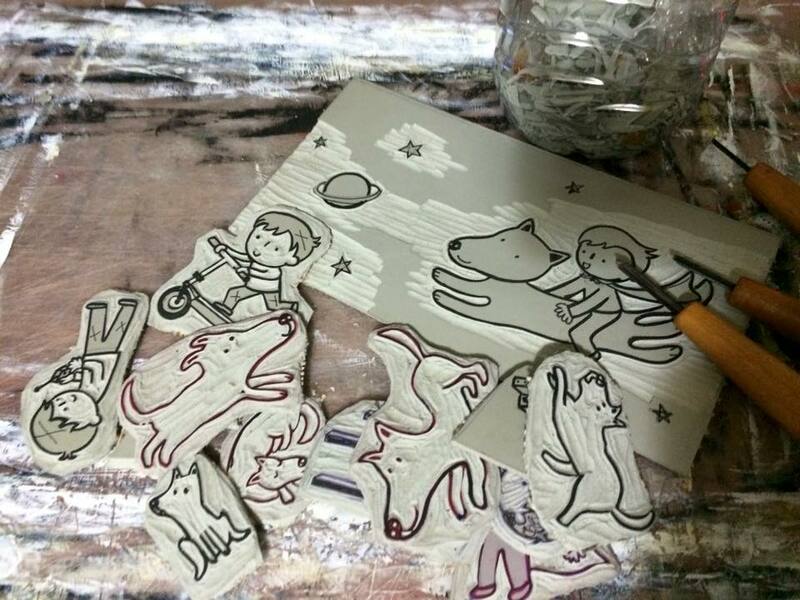 Once she has the initial lino print it is then tidied and colours can be added in PhotoShop. We decided to tidy it up a bit more than in some of her other similar work to bring it closer to the clean lines comic book drawing look, while still being a bit different. I’m glad we chose that method as I’m really happy with the results we got. As you can see from some of the work in progress images, we’ve only finished part of the intended artwork so far. I also asked Jemma to use her lino print technique on an example logo that I knocked up using TypeTool and PhotoShop. It really surprised me how much difference a single image and a curvy logo made to the feel of the site. A simple sketch can be is more effective at getting the point across than many words, even if you don’t know what you’re doing. Using concrete references also works really well. eg. “I’d like the dog to have a similar personality to Dug from Up” is a fantastic shorthand. This stuff takes a long time. I first contacted Jemma about this in October and we’re still working on it in March (ie. 5 months later). This is because Jemma and I both have other commitments and, if you’re like me, it can take a few days to decide if you like something or not. I was quite nervous about how I’d cope with being the client for outsource working. However, I found working with Jemma to be really fun. Seeing my idea coming together has been really great and I hope to be able to have a similar experience with my future outsource work. Husky dogs are awesome, if a little strange. As I’m working with Inkle right now on one of their projects I don’t need to outsource any game artwork but at some point in the not-too-distant future I’ll be wanting to start work on a Cape Guy project so then I’ll need to think about a lot more factors with my outsource work and be dealing with a much larger quantity. Get in touch if you’re an indie game artist who’d be interested in working with me on a project in the future :-).